The utilization of optical circulator starts from the 1990s, and now it has become one of the important elements in advanced optical communication systems. Similar to the function of an electronic circulator, an optical circulator is used to separate optical signals that travel in opposite directions in an optical fiber. Optical circulator has been widely applied to different fields, such as telecom, medical and imaging industries. Are you ready to know more about this optical device? This article will take you to explore the secrets of optical circulator. An optical circulator is built to pass light from one optical fiber to another. It is a non-reciprocal device routing the light based upon the direction of light propagation. Both optical circulator and optical isolator can be used to move light forward. However, there is typically more loss of light energy in the optical isolator than in the optical circulator. Optical circulator usually consists three ports: two ports are used as input ports and one port as output port. A signal is transmitted from port 1 to port 2, and another signal is transmitted from port 2 to port 3. Finally a third signal can be transmitted from port 3 to port 1. Many applications only require two, so they can be built to block any light that hits the third port. An optical circulator includes the components of Faraday rotator, birefringent crystal, waveplate, and beam displacer. The Faraday rotator uses the Faraday effect, which is a phenomenon that the polarization plane of an electromagnetic (light) wave is rotated in a material under a magnetic field applied parallel to the propagation direction of the lightwave. The light propagation in the birefringent crystal depends on the polarization state of the light beam and the relative orientation of the crystal. The polarization of the beam can be changed or the beam can be split into two beams with orthogonal polarization states. Waveplate and beam displacer are two different forms of birefringent crystal. A waveplate can be made by cutting a birefringent crystal to a particular orientation so that the optic axis of the crystal is in the incident plane and is parallel to the crystal boundary. Beam displacer is used to split an incoming beam into two beams with orthogonal polarization states. According to polarization, optical circulator can be divided into polarization-dependent optical circulator and polarization-independent optical circulator. The former is used for the light with a particular polarization state, and the latter is not restricted to the polarization state of a light. Most of the optical circulators employed in fiber optic communications are designed to be polarization-independent. According to functionality, optical circulator can be classified into full circulator and quasi-circulator. As mentioned before, full circulator makes full use of all ports in a complete circle. Light passes through from port 1 to port 2, port 2 to port 3, and port 3 back to port 1. About quasi-circulator, light passes through all ports sequentially but light from the last port is lost and cannot be transmitted back to the first port. For most applications, a quasi-circulator is enough. Duplex Transmitter/Receiver System: Optical circulators can be used to enable 2-way transmission along a single fiber. Transmitter 1 sends signal through Port 1 of Circulator 1 and through the fiber to Port 2 of Circulator 2 so that it is directed to Receiver 2. 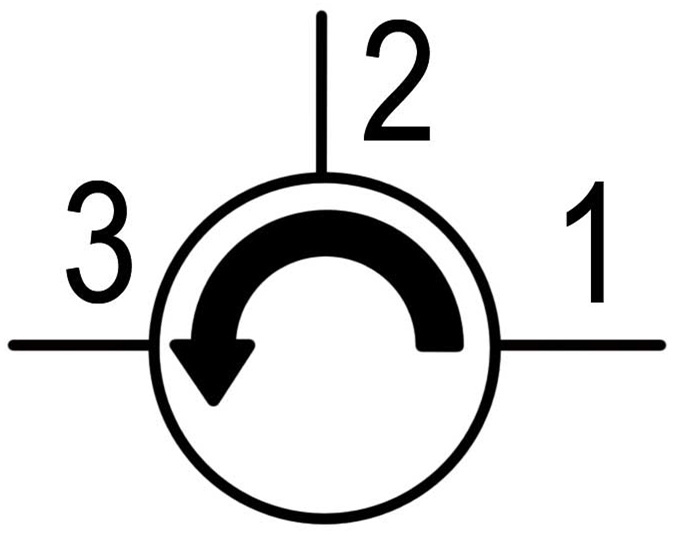 The signal from Transmitter 2 follows the opposite path to Receiver 1. Double Pass Erbium Doped Amplifier: This technique allows high gain amplification of a signal through an erbium doped fiber amplifier. The signal passes through optical circulator and optical amplifier, returns from the fiber optic reflector and passes through the amplifier again. This amplified signal is directed through the return port. Wave Division Multiplexing System: Optical circulators in conjunction with Bragg gratings allow specific wavelengths to be reflected and sent down different paths. From this article, you may have a basic impression about optical circulator. It is an efficient and economical solution to use optical circulator for directing light signal with minimum loss. If you are interested in the optical circulator products, welcome to visit fs.com for more information.